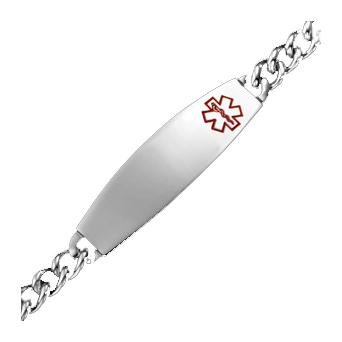 This guys surgical stainless steel medical id bracelet has a shiny plaque with curb links. bracelet. 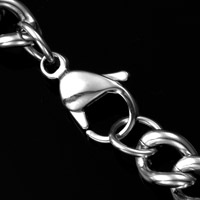 Bracelet closes with a lobster clasp. 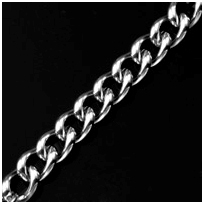 Made of hypoallergenic and non-corrosive 316L surgical stainless steel, also known as 'marine grade' stainless steel due to its increased resistance to chloride corrosion. No further discounts on this laser engraved product. Fits Wrist Sizes: 6.25 - 8.25 in. Sizing: Please measure wrist carefully! 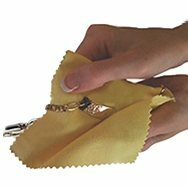 Wrap soft cloth tape measure where wrist bends (no wiggle room) on the hand you will wear your bracelet. JCR1230 - fits wrist 6.25" to 6.75"
JCR1240 - fits wrist 6.75" to 7.25"
JCR1250 - fits wrist 7.25" to 7.75"
JCR1260 - fits wrist 7.75" to 8.25"
JCR2255 - fits wrist 8.75" to 9.25"
Laser engraving on Front and Back. Please enter engraving in Capital Letters and leave spaces between words.